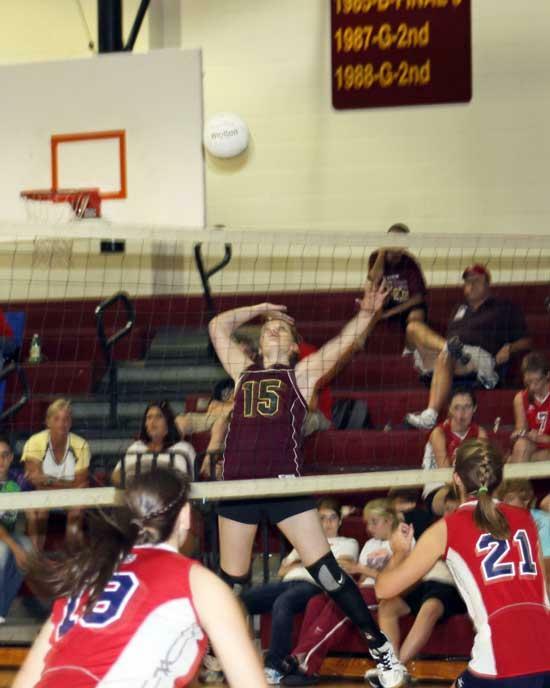 Lionette Abbey Spry supplies a kill against Warren County. Cannon County's volleyball team put itself in a big hole early against Warren County and was never able to recover in a 3-0 (9-25, 19-25, 19-25) setback Thursday afternoon. The Lionettes (2-8) didn't put up much of a fight in dropping the first game 25-9. Warren County jumped out to a 10-1 and never looked back under the watchful eye of veteran coach Franklin Fisher. Cannon County was much more competitive in subsequent games two and three, dropping a pair of 25-19 decisions to surrender the best three-of-five match to visiting Warren County. "I didn't feel as though some of our leaders were playing as they are capable and continued to make the same mistakes in the first game so I took them out," Lionette's Coach Sila Kailiponi said. "Maybe that motivated them because they came back and played better in the next two games. I pleased in that we were more competitive as far as coming back. We just need a little more heart." Whitney Alexander had a solid match for Cannon County. In fact, it was Alexander's serving, along with a solid net presence from Katlyn Currie and Emily Faulkner, that enabled Cannon County to build an early 6-2 lead. Abbey Spry had a nice kill on the outside during the run. "(Alexander) covered well today and she did a good job setting. I thought she really stepped up and had a good match," Kailiponi said. Cannon County also made Warren County work for its win in the third and final game, but the Lionettes were unable to extend the match.